Our signature aircraft – the Endurance – is a representation of our belief that unmanned aircraft are professional tools first and foremost. Tested in NASA’s wind tunnels, the Endurance’s frame is aerodynamic, lightweight, and durable. Its power system is crafted from quality components and delivers impressive performance and efficiency. The advanced autopilot makes both manual and autonomous flying a breeze and provides robust safety features. Finally, the universal payload rail accomodates multiple sensor packages for a variety of missions. Life isn’t just black and white. Your aircraft doesn’t have to be either. Sensors currently integrated to provide a plug-and-play capability include high-resolution 30 x zoom cameras, FLIR thermal, NDVI, radiation survey meter, and a methane sensor. The Endurance is capable of carrying unique payloads and are customized for the mission. Contact us for details and package pricing. The Surveyor Package includes a Sony QX30u Optical Zoom sensor on a vibration-dampened mount. Select a near-infrared filter if your intended application is crop health surveying using NDVI imagery. Select a conventional filter if your missions involve mapping, surveying, and general purpose aerial imagery. The Imaging Package includes a GoPro Hero 4 Black camera mounted to a three-axis stabilized gimbal. An included full-motion downlink provides real time video to the flight control tablet or other nearby smart devices. This package excels at three-dimensional scanning of buildings for real estate applications, but also can be used to provide smooth, high-quality aerial pictures and video. The Enhanced Imaging Package includes a Sony QX30u Optical Zoom camera, which allows for up to 30X optical zoom. 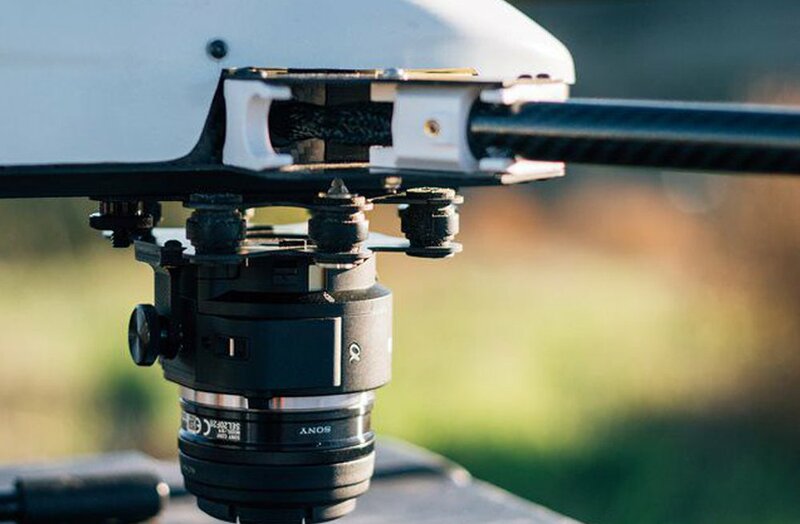 The camera is mounted to a three-axis stabilized gimbal, which is ideal for three-dimensional building scanning, or for capturing crisp, HD aerial videos and pictures. The First Responder Package is among the first professional-quality thermal imaging solutions to enter the commercial unmanned aircraft maket. A FLIR Vue Pro sensor on a three-axis gimbal with a full-motion downlink provides real-time and recorded infrared imagery by day or night. This package is designed to assist fire services, paramedics, police officers and emergency medical technicians. It can also be used for security, infrastructure inspections, and wildlife monitoring. We’ll make sure you’ve got everything you need. If your project requires a customized aerial system or if you would like to lease an Endurance package, please drop us a line at info@airborneworks.com. Our engineers and consultants will be more than happy to walk through the specifics of your project with you.